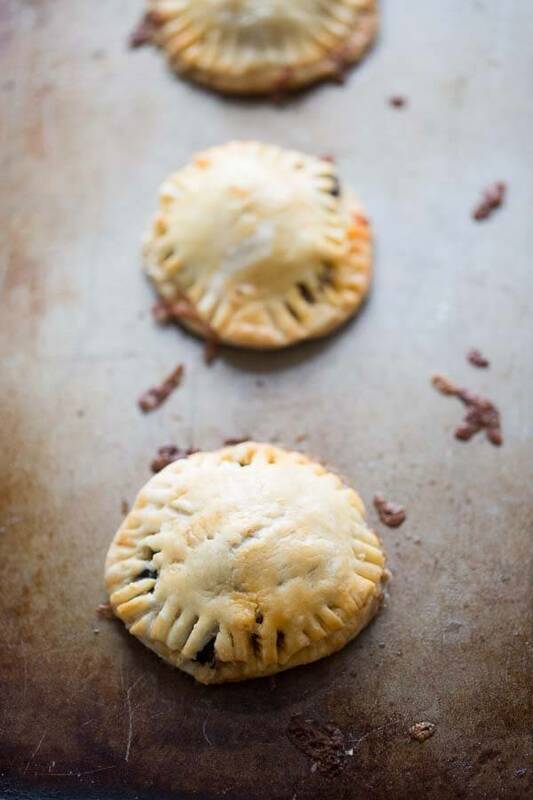 Crispy and flaky hand pies with a kid-friendly taco filling! Kids of all ages are going to love these! Hand pies are little-crimped pie dough rounds that are filled with either a sweet or savory filling. I have shared lemon hand pies, cinnamon roll hand pies, and Greek hand pies. When it comes to sweets, those lemon hand pies are unbeatable, but these Taco Hand Pies are such a great savory option! Kids ADORE these! This recipe starts with boxed pie dough. I think the boxed pie crust tastes great. Sure you could make your own, but this recipe is all about making your life easier! To start, make a simple taco filling using ground beef, seasoning, and black beans. While the beef is cooking, it’s time to work on pie dough. On a floured surface, roll out the pie dough ( you will only need one sheet from the box. Save the other pie crust for another recipe or perhaps double this one). I used a 3-inch biscuit cut the pies out of the dough. You can use larger rounds, just keep in mind that your hand pies may take longer to bake. Place half of your circles on a greased baking sheet. Place roughly a tablespoon of your meat mixture onto the center of each pie round on your baking sheet. Take the remaining pie rounds and place them over the meat mixture. I like to take the tines or a fork and gently press the two pieces together. You could use your fingers as well by dabbing a little egg wash on the bottom round an seal the top layer on with your fingers. However, I think it is easier to press the dough together with a fork then brush a small amount of egg wash over each pie. The pies will only take about 15 minutes to bake. They should be golden and flakey when you take them out of the oven. How To Store Hand Pies? 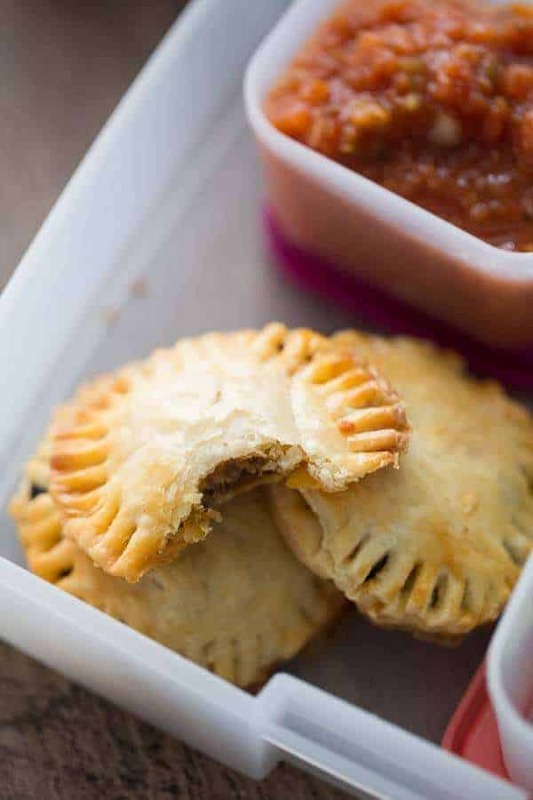 These hand pies will keep in the fridge for 3 or 4 days if kept in an airtight container. Can I freeze hand pies, you ask? YES!! These can be kept in a ziptop bag in the freezer for 1 month. I would prebake them and allow them to cool completely before placing them in the freezer. Pop them in the microwave or even the toaster when you need them! Heat olive oil in a large skillet over medium heat. Add ground beef, stir to crumble. Add salt, chili powder, paprika, onion powder, garlic powder, and cumin; stir. Continue to cook until beef is no longer pink and seasoning has been incorporated. This should take 8-10 minutes. The beef mixture should thicken as it cooks. Stir in black beans, remove from heat and set aside to cool. Preheat oven to 425. Sprinkle flour over a work surface. Roll out one sheet of dough. Cut dough into circles using a 3-inch biscuit cutter, rerolling scraps as necessary. Repeat with remaining sheet of dough. Arrange half of the circles on a baking sheet that has been sprayed with cooking spray. Place a tablespoon of meat mixture on the dough circles, top with roughly a half teaspoon of cheese. Place the other circle halves over the meat and cheese mixture. Pinch edges together with the tines of a fork Combine egg and water in a bowl. Brush egg wash over the top of each hand pie. Bake in the oven for 13-15 minutes or jut until golden. Remove from oven and let hand pies cool slightly before serving. Serve with your favorite taco fixings on the side. 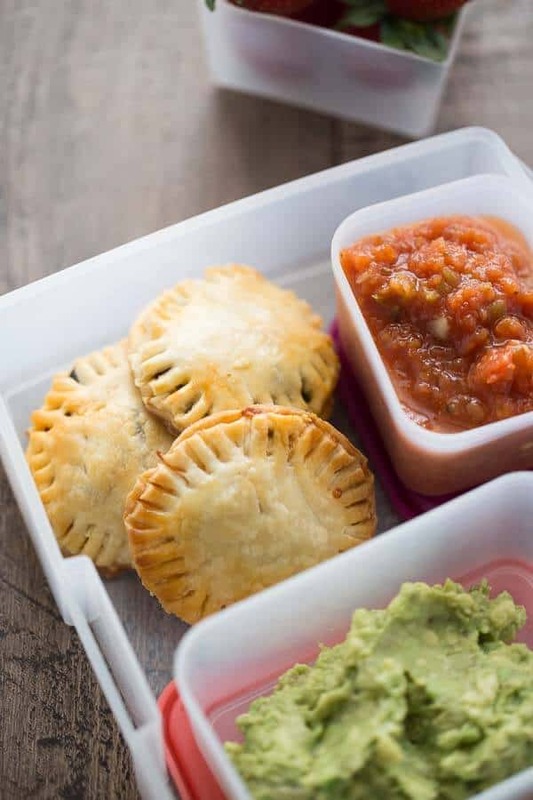 Store hand pies in the refrigerator in an air-tight container or a zip-top bag. Hand pies are the best…any chance to eat pie dough and I’m in! 🙂 Pinned and sharing! I hands down want this for my lunch today!! forget the kids, I want one for lunch!! and is it wrong of me to be super happy mine kids are back in school? Oh my gosh – how great an idea is THIS?? 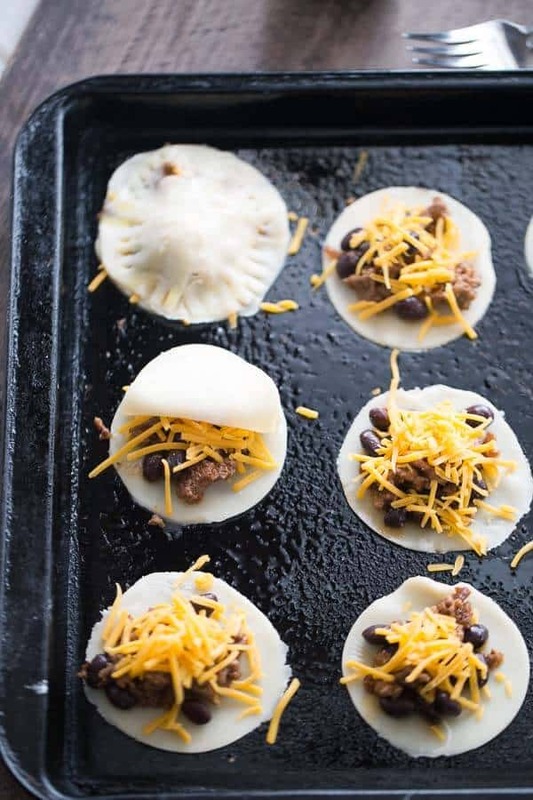 I am totally making these ASAP for Jordan’s lunch because taco meat is the one thing she’ll eat! Squeal!l I can’t wait to make these for our five grandchildren! I invite you to share at my Thursday blog hop. Hugs! This is such a fun and great lunch idea!! Ive never made savoury hand pies before. Thanks for the inspiration! Do you think they would freeze well? I’m trying to get into making big batches of things for lunches to spread out over time. I absolutely think you could freeze these, either before or after baking. Wow, these look great and so easy. I am definitely trying them! My daughter would love these. Thanks for sharing at the Inspiration Spotlight party. Pinned & shared. Awh, when my youngest was little he would sit with lego characters and act whole films out, whispering the dialogue thinking no one could hear him, it was so sweet! I miss that! The pies look amazing too and even though my kids are big people now I’m pretty sure they would love these. I have these in the oven for my kids’ lunches, thanks for the great idea! My question is, do you just put them in the lunchbox from the freezer, and have them eat them cold, or do you defrost and reheat them? Thanks! I defrost them. Sometimes I warm them in the microwave then wrap them in foil so they stay “warm” until lunchtime. I love that these are also freezer friendly! They’ll be perfect for those busy weekends! These look so crispy and yummy! I love these. I make them for my kids all the time and they gobble them up. Thanks for this delicious and fun treat. I’m so happy to hear this! They are a little bit of work, but they are worth it! My kids love them in their school lunches. If you froze these would you microwave them to re-heat and send in a lunch or re-bake in oven. How long would you heat them for. How long would they last in a freezer? Yes, I would microwave them then place them in foil for the kids to take to school. They would only take 45 seconds or so to heat up. They should last a couple of months in the freezer if stored in an air-tight container. You cant buy Pie Dough in NZ. Would Puff or Flaky Pastry do instead ?